Can somebody enlighten me as to who the old man is, and what’s he doing with a boy squatting over the toilet? 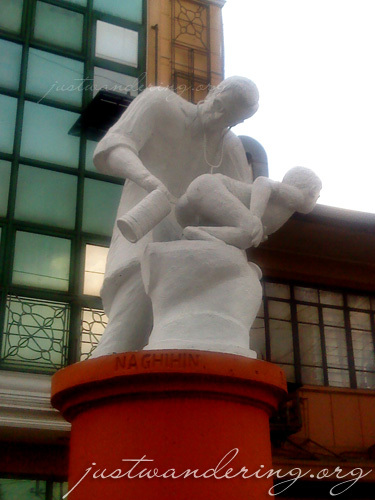 This statue can be found behind the Marikina Public Market, along M. Cruz Sta. Elena street. Uhh…that statue really begs a question (or two)? What? Why? and i also wonder what “Naghihin” etched on the stand means. I thought it was an enema. You have a great blog here. I like checking out travel blogs much like yours at times. I have a blog myself which I hope will be a great resource for those looking to go on vacation. I want everyone to get that “vacation feeling” every time they come to my site. You know what I’m talking about. this statue also caught my attention when I was there. Not sure about this, but it seems like it’s in front of a health LGU and it depicts a doctor/med professional/researcher getting samples for fecalysis. Disturbing. haha. but nice shot. thanks for sharing. Before there were lots of pedestals with inscriptions – “Naghihintay ng Bayani” in Marikina. This is one of them. maybe other syllables were plastered. The man was a doctor considered as a local Bayani in Marikina. During his time, he devoted his knowledge in eradicating the epidemic of diarrhea or a disease related to it and treated those who suffered for free. He lived somewhere in the area where the monument is located that’s why that spot served as a plaza in his honor. The sculpture lacks artistry and a sense of creativity though.